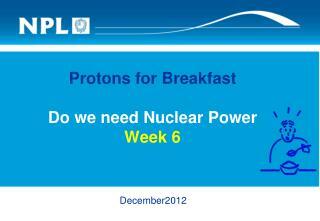 decay of Plutonium-238 to create about 230 W of electricity. operate unattended for several decades. other systems needing room temperature operation. 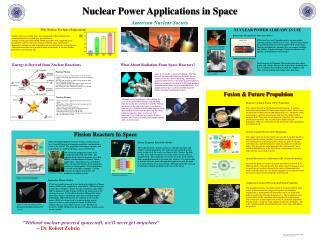 Why Nuclear For Space Exploration? warm by pellets of Plutonium. What About Radiation From Space Reactors? 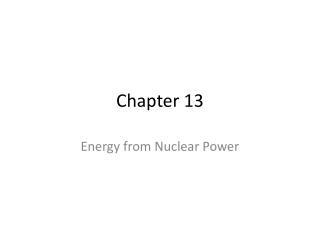 Fission occurs when a free neutron strikes a heavy atom such as Uranium or Plutonium. 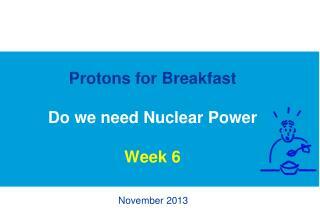 This collision causes the atom to break apart or fission. Space is essentially an ocean of radiation. The Sun gives off far more radiation from its fusion than we could ever become close to matching. The Earth’s magnetic field protects us from this harmful radiation. However, astronauts are exposed to this, and spending too much time in space can lead to health effects. 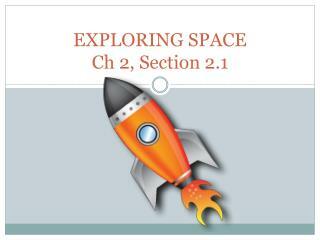 It is important that space crafts be shielded from the hostile radiation environment of space. 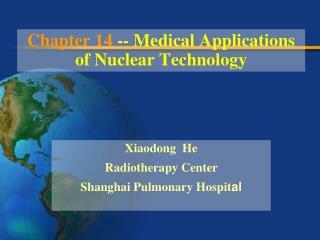 Although nuclear reactors give off radiation, the crew can be protected by distance and shielding. Note the reactor is located on the end of the boom in the picture of the ship on the right, a safe distance from the crew. 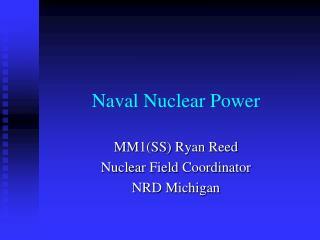 Nuclear reactors allow ships to reach their destination faster actually lowering their total radiation exposure. 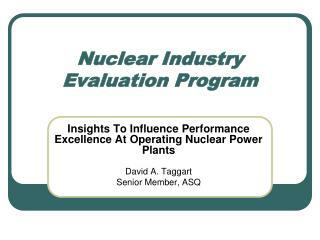 Since reactors are well contained, it can withstand any reentry disasters and pose little to no risk to the general public should such a scenario occur. 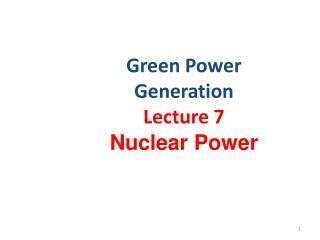 This concept is based on the Magnetic Fusion concept. It confines Deuterium and Tritium (D-T) ions with a magnetic field. The D-T ions are heated to a temperature of 100 million degrees C. All matter at this state becomes a plasma or ionized gas and must be confined with a magnetic field. These ions are moving so fast that they fuse when they smash into each other. The reaction creates highly energetic byproducts which are accelerated out the back of the engine propelling the craft forward. This engine works on the Inertial Fusion concept. A small D-T pellet is injected into the reactor chamber. Several lasers or heavy ion beams fire simultaneously at the target pellet causing the pellet to collapse and inducing a small thermonuclear explosion similar to a hydrogen bomb. The force of the explosion propels the craft forward. Main technical difficulties are in the laser driver systems being very heavy and requiring a great deal of power. Electrostatic Fields are used to accelerate fusion fuels (either D, T, or 3He) toward the center of the grid. The grid is mostly transparent and the particles are accelerated toward the center at which point they strike each other and fuse. The fusion fragments are accelerated out of the reactor and are used to propel the craft forward. This propulsion scheme uses pellets mixed of Uranium and D-T fuels. 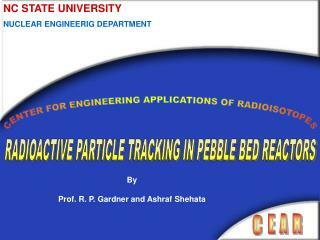 Lasers or heavy ion beams compress the pellet. At maximum compression, a small number of antiprotons (10^9) are fired at the pellet to catalyze the Uranium fission process. The fission heat causes a fusion burn and the expanding plasma pushes the craft forward. This system gets around typical restrictions of antimatter propulsion because it uses a relatively small amount of expensive antimatter. This craft would be capable of reaching Pluto in 3 years with a 100 million ton payload. 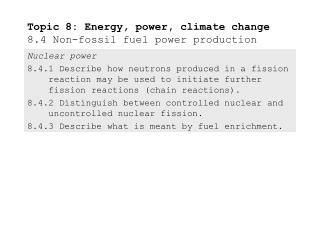 Nuclear Fission Propulsion works by having a reactor generate heat. Liquid Hydrogen or Ammonia propellant is pumped into a vessel by the reactor. The propellant is heated up, vaporizes, and is ejected out of a nozzle propelling a spacecraft forward. 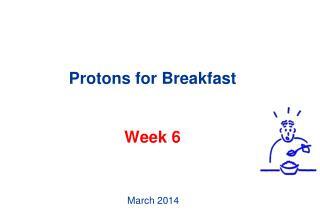 The fragments from a fission reaction are extremely energetic and could be used for propulsion. 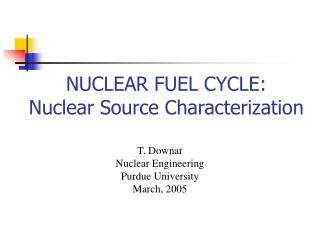 The fuel is located on thin disks that rotate in and out of the reactor (see figure to left). Because the disks are thin, many of the fragments can escape and be accelerated by a magnetic field. These fragments are ejected out of the probe and the ship is propelled forward at extremely fast velocities. It is also possible to attach a sail to the probe allowing the fragments to push the probe even more when far away from the Sun. The high speeds this craft can reach make it ideal for probing nearby stars in the future. The first fission propulsion systems were investigated in the 1960s and 1970s. 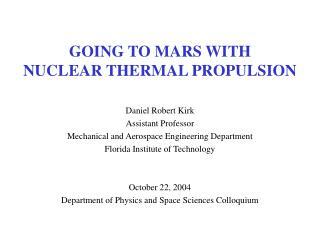 The capstone design from this program was called NERVA (Nuclear Engine for Rocket Vehicle Application). 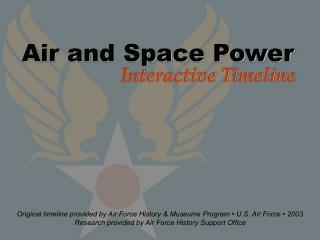 The program was cancelled in 1972 as the finishing touches of the propulsion system were being applied. Fission propulsion is a tested and feasible technology. Current research is in engineering nozzles and propellant circulation systems. Design and conception of the Fission Fragment Interstellar Probe. 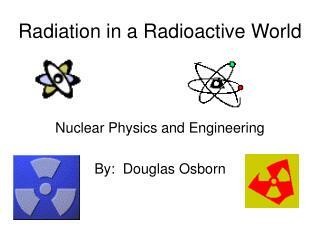 Designs for early Nuclear Fission Reactor Propulsion systems in 1960s and 1970s. NASA has recently proposed to start work on the Jupiter Icy Moons Orbiter (JIMO) to be completed by around 2011. JIMO is designed to orbit three of Jupiter’s moons: Europa, Ganymede, and Callisto. JIMO’s mission is to find evidence of life on the moons such as the existence of oceans. 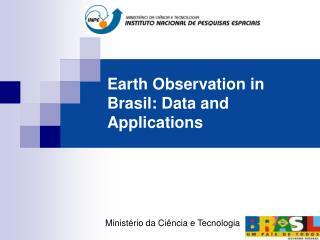 It will collect data that will hopefully tell us about their surfaces and perhaps some clues as to their origins. Additionally, JIMO will measure the radiation levels near the moons. 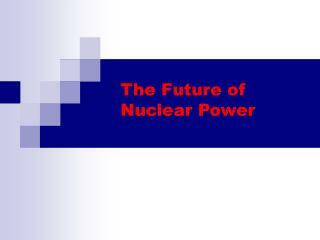 JIMO is to be powered by a nuclear fission reactor projected to have a power output of around 250,000 Watts. Compare this to Cassini which runs on a mere 100 Watts of electricity. 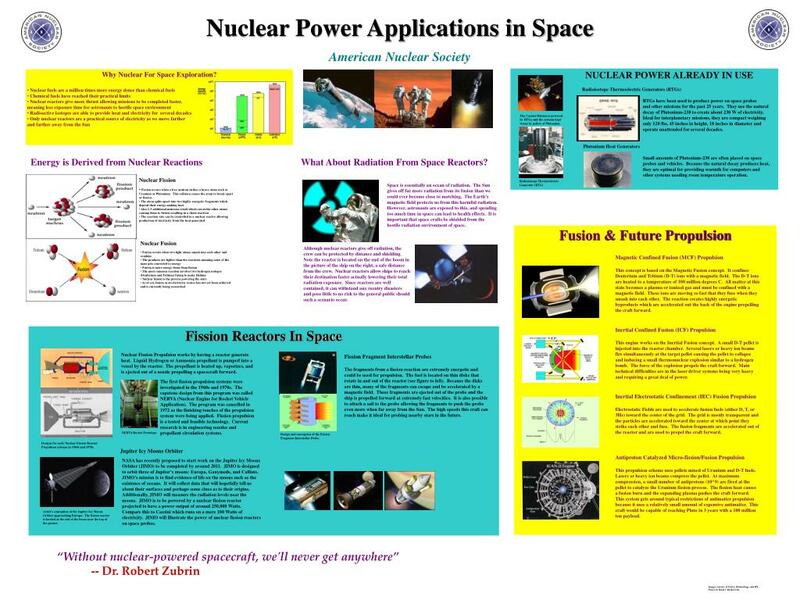 JIMO will illustrate the power of nuclear fission reactors on space probes. Artist’s conception of the Jupiter Icy Moons Orbiter approaching Europa. 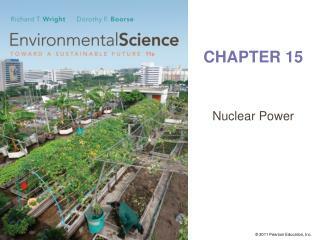 The fission reactor is located at the end of the boom near the top of the picture. Space power! 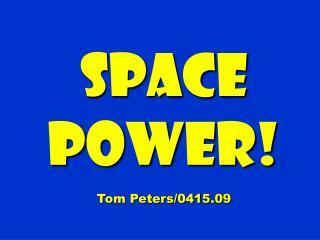 Tom Peters/0415.09 -Space power! tom peters/0415.09. note : to appreciate this presentation [and ensure that it is not a mess ], you need microsoft fonts: “showcard gothic,” “ravie,” “chiller” and “verdana”. 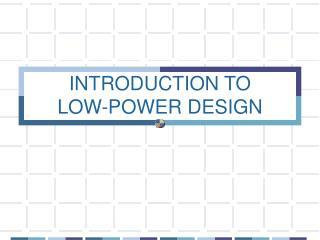 Submodule Differential Power Processing in Photovoltaic Applications -. 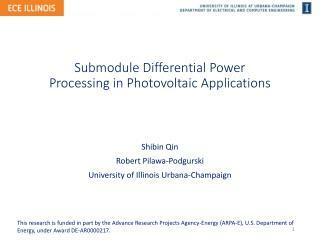 shibin qin robert pilawa-podgurski university of illinois urbana-champaign. 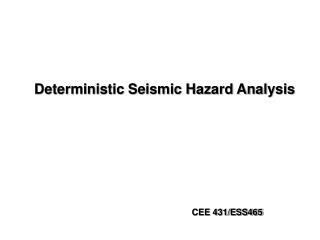 this research is funded in part by the advance research projects agency-energy (arpa-e), u.s .